If you live in or are planning to stop by the LA area during the Holidays, I have some really cool deets to share with you all! 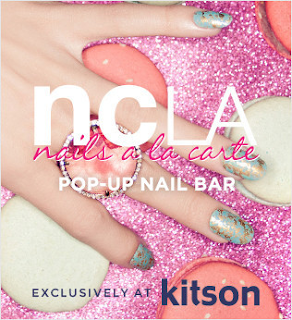 Kitson and NCLA have teamed up for a very special pop - up nail bar throughout the month of December at their Robertson Blvd Store. How it works is you get a choice to mix and match up to five menu choices with various gels and nail art options. They even have gold foil nails, which are one of my favorite nail trends at the moment. If you're a mani-fanatic like me, you definitely should check this out. this is such a neat idea! I'd love a nail re-vamp haha. Hi dear, you have a very nice blog! I follow you now! Wish I would live in LA!! Great effort... superb organic content. If you are interested in Simple and Easy Flower Drawing tutorial do have a look.